This is basic of .NET interview questions which are mostly asked to 1 year experience and above candidates. So here is a simplified answer we have put in front with a diagram so that you can learn in a more easier manner. There are five stages of any project initiating, planning, executing, controlling, and closeout. These are general phases and change according to domain. Example when writing a book we will have the following mappings initiating (contacting publishers, getting copy right etc), planning (Table of contents of book, Number of chapters, tool to use, chapter wise deadlines etc), executing (Actually writing the book), controlling (proof reading, language checks, page alignments etc), and closeout (Finally printing and on the shelf for sale). Therefore, this classification is at very broader level, for software development the above figure shows the mapping. 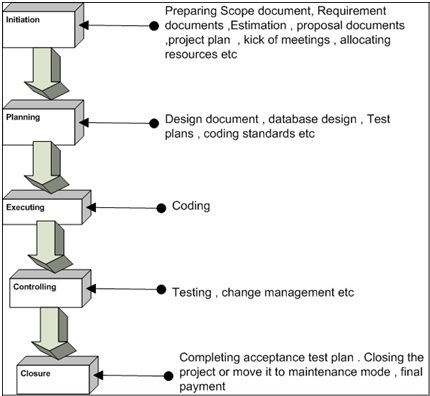 During Software project management interview, expected answer is requirement phase, design phase, coding phase, testing phase, and project closure. But you can just impress the answer by giving a general answer and then showing the mapping. 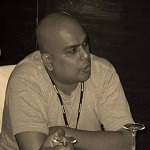 From more on author's blog related to interview questions and answers for .NET click and visit.